The CalAmp flagship LMU-4225™ product has the features, expandability, and flexibility with the intelligence to meet all customers ever changing needs in fleet management. The LMU-4225™ offers a full set of features, comprehensive I/O system and expandable accessories that make it an industry leading value proposition. The LMU-4225™ expandability and flexibility lowers the cost of delivering, supporting, and growing fleet management solutions. 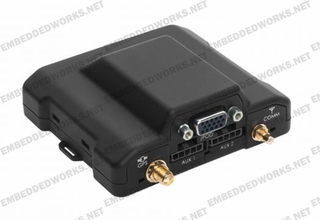 The LMU-4225™ is designed to support customers needing an array of vehicle interfaces. For example, the serial ports supply switchable power at selectable voltages to ease the installation of peripheral data devices. The integrated jPOD™ ECU (Engine Control Unit) interface reads and transmits heavy-duty engine condition and performance data such as engine temperature along with the fault codes to provide the best possible real-time picture of vehicle health. In addition, the LMU-4225™ offers a WiFi version as an alternate broadband communication. The LMU-4225™ employs CalAmp industry leading on-board alert engine, PEG™ (Programmable Event Generator). This advanced engine monitors external conditions and supports customer-defined exception-based rules to help meet the needs of your application. PEG™ continuously monitors the vehicle environment and responds instantaneously to pre-defined threshold conditions related to time, date, motion, location, geo-zone, input and other event combinations. With PEG™, your unique application will meet demanding customer requirements. This behavior can be programmed by CalAmp before shipment, at a customer facility, or over-the-air once the unit has been fielded. The LMU-4225™ also leverages CalAmps industry leading over-the-air device management and maintenance system, PULS™ (Programming, Updates, and Logistics System). Configuration parameters, PEG™ rules, and firmware can all be updated over the air. PULS™ offers out-of-the- box hands free configuration and automatic post-installation upgrades. You can also monitor unit health status across your customers fleets to quickly identify issues before they become expensive problems.